Corneal Endothelial Degeneration (CED) is a degenerative condition in dogs that affects the clarity of the cornea. This age-related disease can result in blindness and severe ocular pain from secondary complications. The cornea is the clear window at the front of the eye. It is a very delicate structure which is less than a millimeter thick. Endothelial cells are located at the most inner layer of the cornea and contain tiny “pumps” that are responsible for maintaining a proper fluid balance in the corneal tissues. This function is critical to ensuring that the cornea remains transparent for vision. How is corneal endothelial degeneration diagnosed? When these endothelial cells become sick and deteriorate and are no longer functional, the normally clear cornea becomes water-logged, swollen, and opaque. This condition is termed corneal edema. Typically eyes with corneal edema have a foggy or blue appearance to the normally clear tissues at the front of the eye. As the edema progresses, small fluid-filled blisters, called bullae, can form on the corneal surface. These bullae are fragile and can rupture causing ocular discomfort. Once corneal edema begins to form, unfortunately, it typically progresses with time. Early in the disease process no pain is associated with the opacification and most patients cope well. Symptoms that pets with corneal edema may exhibit, if they are in pain, include blinking, tearing, rubbing of the eye and face, and avoidance of or obvious discomfort when in bright light. How is corneal endothelial degeneration treated? Treatment options for this condition are limited. Palliative medical treatments such as application of hypertonic saline ointment to the corneal surface are aimed at stabilizing the corneal tissues and decreasing corneal bullae formation. 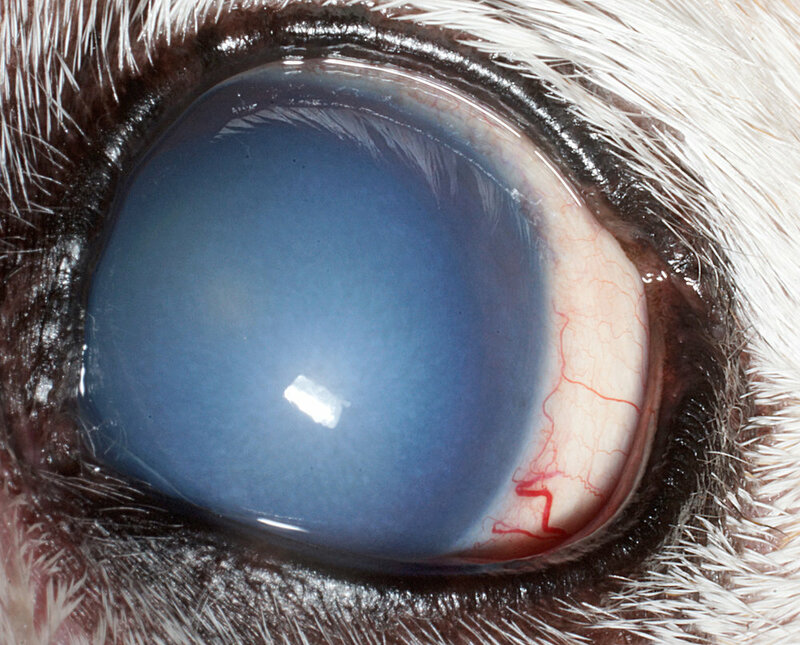 Some of the surgical options for treatment of CED include corneal transplant, corneal grafting or flap placement, and thermokeratoplasty procedure and should be discussed with a veterinary ophthalmologist. Identification and appropriate diagnosis early in the course of the disease, and early medical or surgical intervention can help your pet avoid ocular discomfort and slow, delay, or reverse vision loss.